The anticipation is high and the drive is long as the two friends head for the beach. There’s been hurricane watches along the Eastern coast but the hurricane is still out to sea far enough for no warnings being warranted. Checking into the hotel and donning their swim suits they grab the beach umbrella, small ice chest with their bottles of water, sun screen, and towels. The wind is blowing, the sun shines brightly, and the sea gulls are swarming near a couple flipping pieces of potato chips up into the air. One lady smooths sun screen on her arms, legs, and chest while the other spreads their towels, pops the umbrella open and shoves the pole into the sand. They’re ready to play in the salty water and let the waves slap at their bodies. The day has been filled with sand, sun, salty water, waves beating their backs, perusing a gift shop, a dinner of crab legs, a stroll along the beach, and a night of much-needed rest. The next day is filled with the same anticipation of playing in the ocean. The waves are meaner and the water churning, but no restrictions have been ordered. Being cautious the one lady, who does not swim, stays in the shallower water while the other one wades out deeper. She jumps up to avoid the bigger waves knocking her over. She laughs joyously as a wave smacks her in the back and rolls over her head. While swiping the salty water out of her eyes a large wave sneaks up behind her and smacks her, full force. It hits her hard. She is thrown forward, down and under, the sea churns around her and fighting to keep from drowning at the bottom of the sea she struggles. 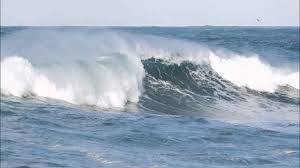 Her knee suddenly twists, pops, and she tries not to scream as she claws her way along the sandy bottom fighting the churning water that’s trying to drag her back out to sea. On wobbly legs she stands. Swiping at the water in her eyes, coughing, and taking deep breaths, she limps her way toward the sandy beach. “Are you sure you’re okay?” The Man asks again with concern written across His face. The next morning the beach is closed to swimming. The hurricane warnings are up.